Leon received his BSc, specializing in immunology and infection, from the University of Alberta, Edmonton, Alberta, Canada. He went on to conduct his PhD research at the University of Alberta, Department of Biological Sciences, during which time he studied the roles of cytokines in the regulation of fish macrophage antimicrobial responses against Mycobacterium marinum. Leon's doctoral work was awarded the Governor General's Gold Medal. Leon performed his postdoctoral research at the University of Rochester, Rochester, NY, USA, where he espoused the Xenopus laevis frog model towards the study of amphibian macrophage biology. Leon is currently an Assistant Professor at the Department of Biological Sciences, George Washington University, Washington DC, where he and his research team are investigating many different faces of amphibian immune development and functionality. Dr. Popovic received his MSc in Molecular Biology and Physiology, at the University of Belgrade, Faculty of Biology, Department of Molecular Biology and Physiology, Belgrade, Serbia. He went on to receive his doctorate at the Department of Pharmacology of Natural Products and Clinical Pharmacology, University of Ulm, Ulm, Germany. His first postdoctoral tenure was within Reproductive Immunology Group at the Institute of Medical Immunology, Charité, Medical University of Berlin, Germany. After spending two years of research in his native country of Serbia, at the Department for Radiobiology and Molecular Genetics, Institute “Vinča” in Belgrade, he traveled to the US to study kidney immunology at Center for Clinical and Translational Research, the Research Institute at Nationwide Children’s Hospital, Columbus, OH. Subsequently, he investigated the immune interactions between T effector cells and antigen presenting cells at the Department of Microbiology & Immunology, University of Rochester Medical Center, Rochester, NY. Dr. Popovic has been an integral member of the Grayfer lab since 2017, studying amphibian granulocyte and macrophage responses to viral and mycobacterial pathogens. Upon finishing her college education in South India, Amulya moved to the United States for her post secondary studies. She received her MSc degree in Microbiology from Georgetown University, where she developed an inclination towards research and which led her to pursue a PhD program here at George Washington University. Amulya is interested in studying frog innate immune responses against various pathogens that are known to be contributing towards their declines. Her main research focus is on macrophage biology, specifically in understanding how these cells orchestrate antimicrobial immune responses in frogs, using Xenopus laevis as a model. Outside of the lab (if she's ever seen not doing research), Amulya enjoys experimenting in the kitchen as well, trying out different recipes. All of us in the Grayfer lab can attest to her incredible cooking skills! Amulya also loves dancing to Bollywood tunes and hopes to be able to sing 'Miami' by Will Smith in its entirety before defending her thesis. Julia is entering her junior year of undergraduate studies at the George Washington University. She has joined the Grayfer lab in the summer of 2018 and has focusing her research in our lab on defining the roles of amphibian interferon cytokines during the tadpole and adult frog immune responses to the Frog Virus 3 ranavirus. Aside from her research and scholarly studies at GWU, Julia is learning to play the guitar and enjoys outdoor activities, whether it is a beach, a mountain, a city, or a landmark. She is also a Chapter Officer of Sigma Alpha Lambda and participates in Club Frisbee and Club Gymnastics. 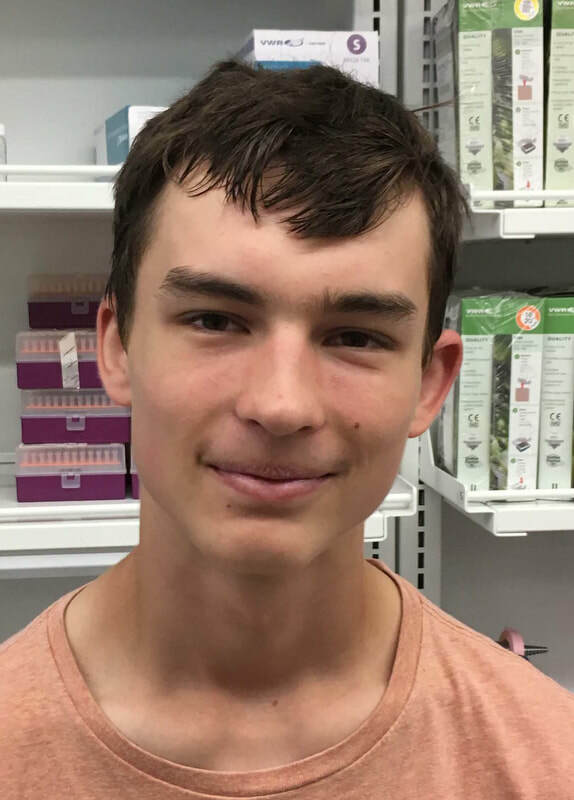 Phillip joined our lab in the summer of 2018 and will continue his research with us as part of his internship with the local Thomas Jefferson high school. Phillip has mastered many different molecular techniques and is now diving deep into his research project, which focuses on the determinants of frog macrophage susceptibility to viral, mycobacterial and fungal pathogens. Phillip is a master builder and is an aspiring and a quiet successful herpetologist. He designs his own reptile and amphibian housing tanks and has an impressive collection of cold blooded vertebrate pets. While working towards her BSc at the George Washington University, Emily conducted undergraduate research in our lab. During her tenure with us, Emily discovered that tadpole and adult frogs mount distinct antiviral interferon cytokine responses within different tissues of Frog Virus 3 infection. Emily also demonstrated that tadpoles and adult frogs rely on distinct interferon cytokines during responses to distinct pathogenic challenges. Emily's work has culminated in two first author publications and represents a substantial contribution to our field. Emily is presently stationed with the Peace Corps in Botswana, working with the local communities on projects related to bettering their education and public health. Emily knows all of the lyrics to, and can sing 'Ice, Ice Baby' at a moment's notice! Aashish conducted research in the Grafer lab during the summers of 2016 and 2017, when on break from his studies at the Thomas Jefferson high school. During his time in our lab, Aashish mastered molecular techniques such as RNA isolation, cDNA synthesis, conventional and quantitative gene expression analyses. Aashish then made significant contributions to defining the differences in the pathogen recognition capacities of distinct frog macrophage populations. We are in the final stages of preparing a manuscript describing some of this research. Aashish graduated high school in 2018 and is beginning his undergraduate studies at the University of Virginia.